You may have noticed I haven’t spent much time busting UFOs these past couple of months. This doesn’t mean I don’t have any left (if only! ), it means I’ve gotten rid of a bunch, which feels pretty good, and simply moved on to creating other things. The new things I made got finished and are being used so I am definitely improving in the “finish what you start” department. Well, apart from that quilt that’s been almost stationary on my design wall since January, but I promise I’ll get to that soon. I haven’t done much creative things during the past couple of weeks and needed to get sewing again. Preferably with a simple no fuss instant gratification project. 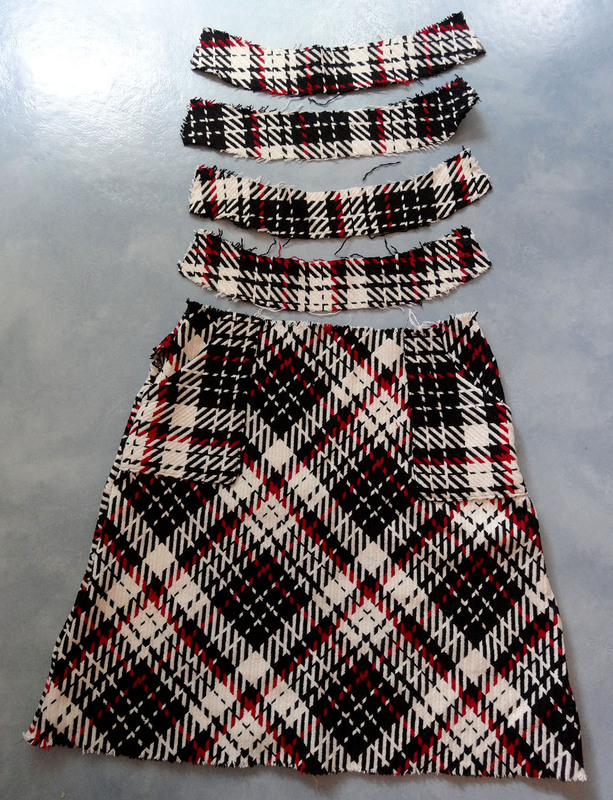 I had looked at this unfinished skirt several times already unsure what to do with it. I think I started it over 3 years ago and at the time it seemed like a really good idea to use this fabric for a skirt. Now I think the fabric was never really meant to be used for a garment. 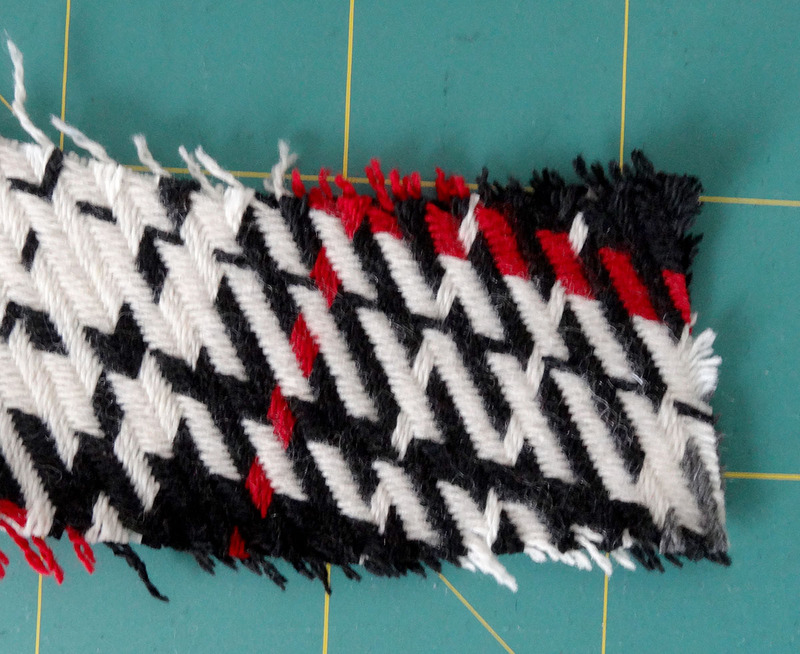 It is quite loosely woven and frays horribly. Cutting the pieces on the bias resulted in too much stretch so it ended up way too big. I’m also not so sure anymore that the finished skirt would flatter me all that much. But, what to do with it? Turning it into another garment wasn’t going to work either. And then it hit me. When in doubt make a pillow. 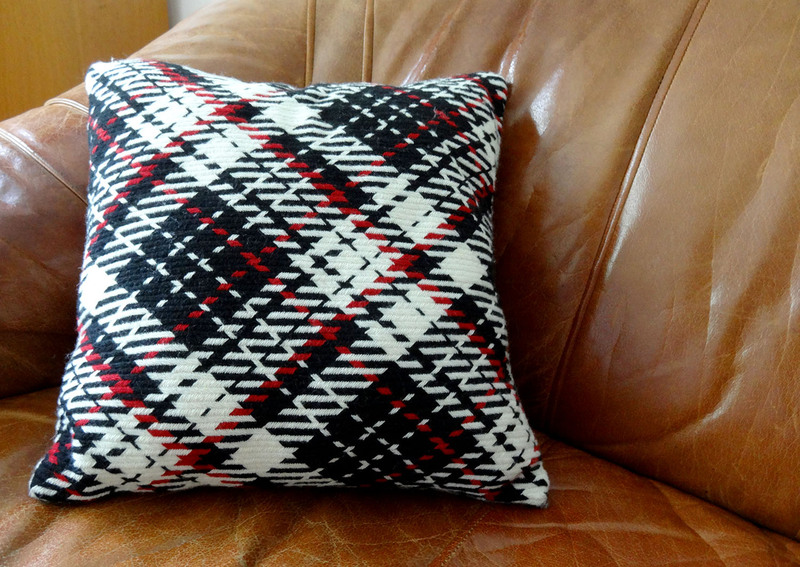 Pillows are one of my all-time favourite projects. I should really get a larger couch just so I can properly display my mishmash of pillows in all their glory (you surely must have heard stranger reasons to buy a new couch, right?). 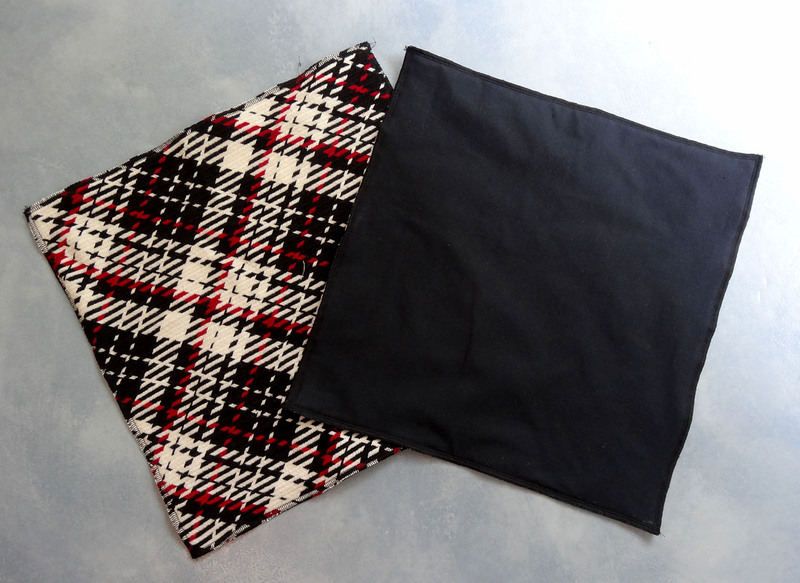 I used the back of the skirt to cut one side of the pillow on the bias and a left over piece of fabric to cut the other side on the straight of grain. To add some stability and minimize fraying both pieces were underlined with some Kona cotton and the edges were overlocked. The bias piece definitely stretched out during this process. Luckily not really noticeable in the finished pillow. I couldn’t find my invisible zippers so decided against making a closure. Instead I sewed all around the pillow right sides together leaving a small gap for turning. Then I stuffed the pillow with the filling of another pillow that was no longer being used because it had become lumpy from being washed too often. Worked brilliantly (and no my new pillow isn’t lumpy!). Finally the gap was closed with some invisible hand stitching. 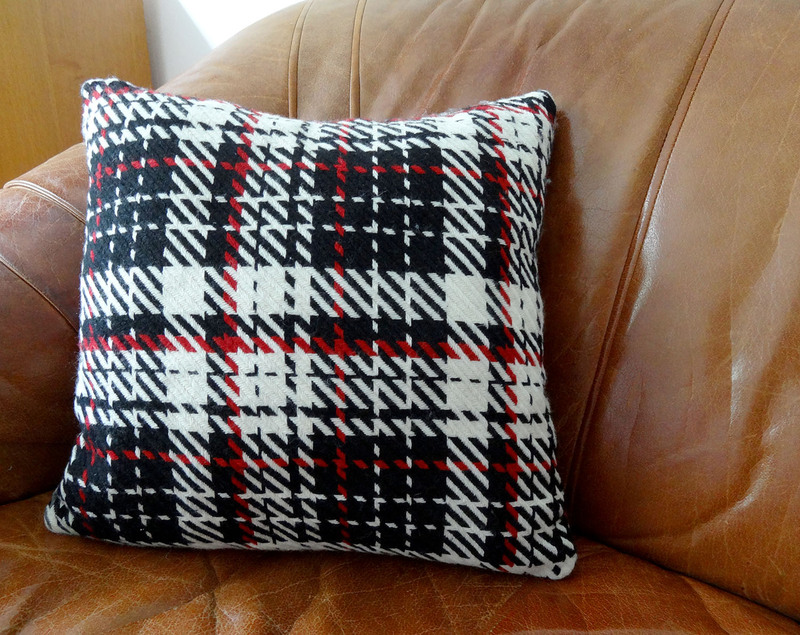 I love my new pillow and don’t care that it doesn’t really match with the rest of our living room décor. It is much more useful than the skirt ever would have been. I know I’m not the only one that occasionally struggles to get even top- or edge stitching. 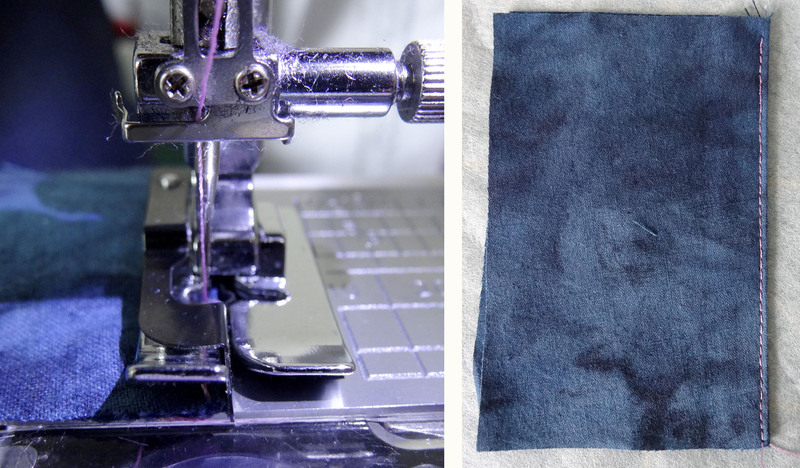 For most sewing machines you can buy a top stitch- and edge stitch foot, but they cost money and that money could also be spend on fabric, right? There is a much cheaper solution. 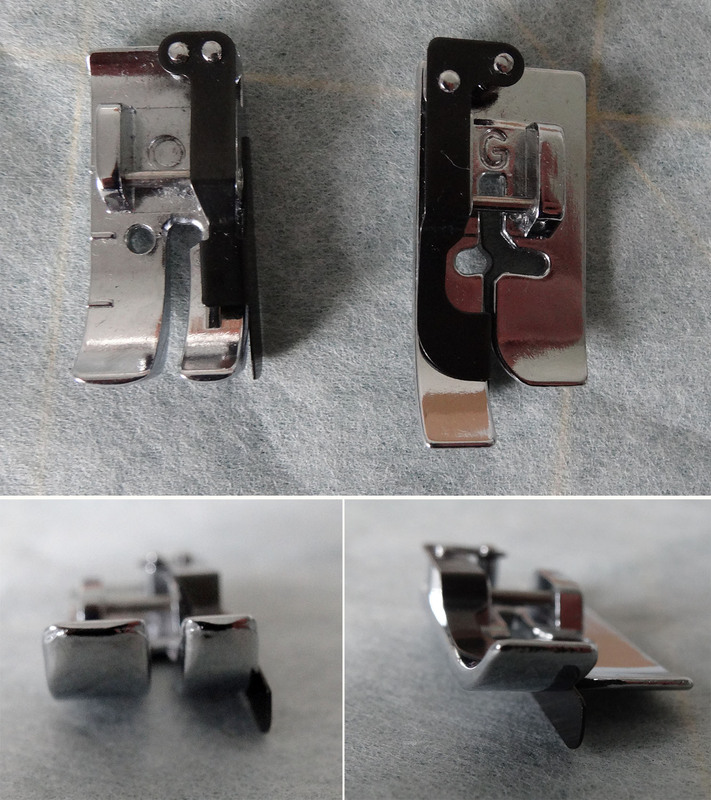 Most sewing machines will at least come with a blind hem foot and often also with a ¼ inch foot. Mine are from Janome and if your sewing machine is a different brand they might look slightly different. I expect a stitch in the ditch foot (that I don’t own) will also work really well. Left: 1/4 inch foot. Right: blind hem foot. The thing these feet have in common is that they have a guide that you can place your fabric against as you are sewing. If you place this guide on top of a seam and keep it there while you are sewing your top stitching will be a very consistent distance from the seam. If you place the edge of your fabric against the guide and keep it there while sewing you can stitch really close to the edge. Sometimes you’ll have to adjust the needle position for it to work properly. When I place the guide on top of the fabric I’ll usually decrease the pressure on my foot to allow the fabric to be transported smoothly. The guide of the 1/4 inch foot is placed on top of the seamline during topstitching. These feet have some limitations compared to the feet that were really meant for the job. With my ¼ inch foot I can only stitch a ¼ inch away from the edge because there is only a small hole for the needle so I can’t change the needle position. With the blind hem foot I can adjust the needle a bit to get different distances away from the edge but this is also somewhat limited. Ever since I started using these feet to do my topstitching I’m much happier with the results. The edge of the fabric is placed next to to the guide of the blind hem foot. I adjusted the needle position so I could stitch close to the edge. Did you ever consider using these feet for top- or edge stitching? Do you now more feet that would be helpful to achieve accurate topstitching? The one thing the items I made yesterday have in common is that I really needed to get them finished but I never started them because I wanted to make other things first. The problem was the other things didn’t get made either because I felt I had to make these items first. It was a rather depressing vicious circle but yesterday I finally decided to get a grip and just get it over and done with. The stupid thing is I enjoy making these items so it really is the lure of the even shinier project that can sometimes keep me from being productive. First, I made this fabric pouch. Intended for someone I swapped some handmade goodies with. I received my package weeks ago and still needed to get my items shipped. Bit of a problem if they aren’t actually finished… I hope it was worth the wait. The dimensions at the base are 23.5 x 10.5 x 18 cm (l x w x h). I chose these fabrics because these colours should be her favourites. The outside fabric is “Journeys dot dot dash” by Kathy Davis for Free Spirit. I bought it in Stockholm two years ago when I was there for a conference. I really like this quite simple design. 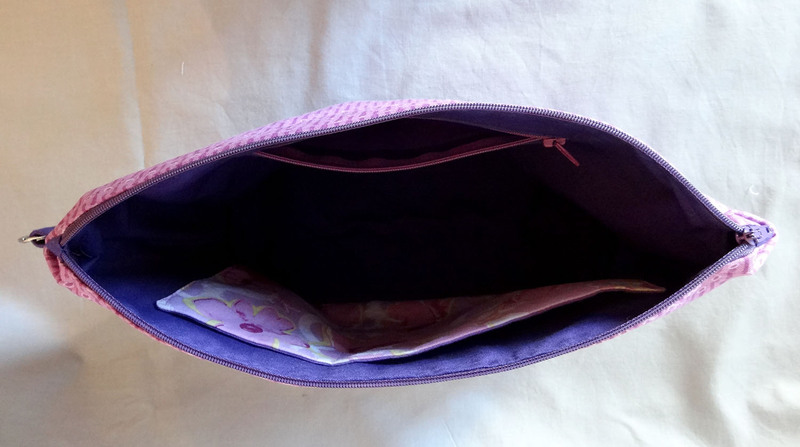 On the inside I made a zipper pocket and a patch pocket that is divided into two. I hope it will be useful for storing craft supplies. 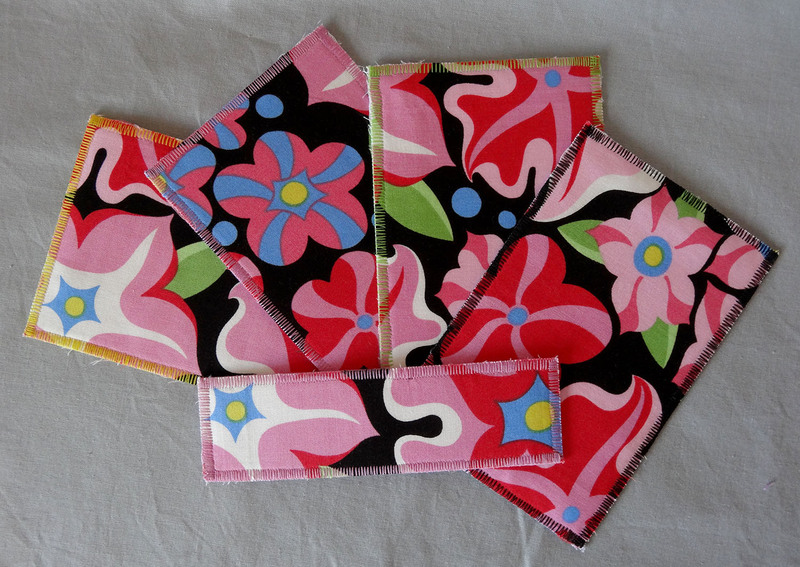 Then some fabric postcards and a bookmark. Made the same way as described here. This fabric has a bit of a retro vibe that I think is fun and even though (or maybe even because?) it is a large scale print I think it works very well for postcards. It is “Wild Child Passionate Petunias” by Jane Sassaman for Free Spirit. I believe I also have it in a different colourway so perhaps I’ll make some postcards with that one as well. Lastly, a Growing up Sew Liberated envelope tee size 6-12 months for a baby boy born in April. This really is my go-to baby pattern. I kept it simple and used only one fabric (left-overs from the Comox Trunks) for the t-shirt but added some accents with contrasting thread for the coverstitching. This has the added benefit that I only have to thread my overlocker and coverstitch machine once instead of switching the right colour thread from one machine to the other several times during the construction. Because the sleeves on baby t-shirts are absolutely tiny I usually sew the hem first before attaching the sleeve instead of sewing it in the round. I did have difficulty matching it up when the sleeve seam was sewn. Apart from that I think the t-shirt turned out really good.